This pair of pretty porcelain bowls are different in size and decorations, but are from the same kiln in Japan, probably from Arita in the Saga Prefecture. The two blue characters on the bottom are identical on each bowl, but as yet unidentified. 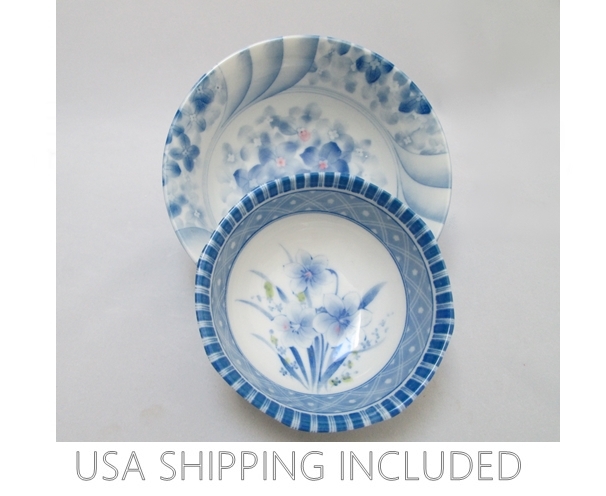 Both bowls are pure white porcelain, with blue and white floral and geometric designs. The larger of the two bowls measures 6 inches across, about 2 3/4 inches high and has splashes of pink on the flowers in the inner center. It also has a raised diaper pattern on the outside, along with two blue lines encircling the foot rim. The smaller of the two measures 4 inches across, 2 inches high and has clusters of green dots on the interior flowers. The outside of the bowl is plain white and has 8 panels. These bowls are in excellent condition and are useful both for ornament and serving.